Acquired: In person 1993, CGA Youth Golf Tournament. John Elway was a lot different than the other players at the tournament. While we were waiting for him to golf, he stopped, approached us and said, “If I sign all of your cards, will you leave me alone?” Wow man- how do you expect me to react? Josh and the other guys who were with me sheepishly said, “Sure John.” Of course I would throw in the barb of, “Good luck winning the SuperBowl this season!”, After he’d sign all 5 of my cards- (even though I was only gunning for two signatures tops). This was a memory that really stuck in my mind because he wasn’t gracious at all about his status, and in a way I’ve always held it against him. 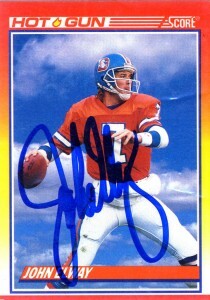 In 1983, the consensus #1 draft choice from Stanford refused to play for the Baltimore Colts who in turn traded John Elway to the Denver Broncos where he’d become the face of the franchise. 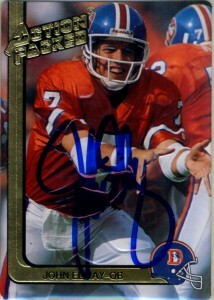 (The trade was executed for Chris Hinton, Mark Hermann, and Denver’s first round pick of the 1984 draft.) Elway would start 11 games that season under coach Dan Reeves play action offense and have a lackluster start with 7 touchdowns and 14 interceptions. John would display his innate ability to scramble early on with a 5.2 yard per carry average. 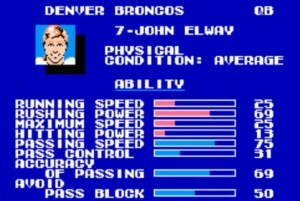 By 1987, Elway had moved into the upper echelon of quarterbacking. 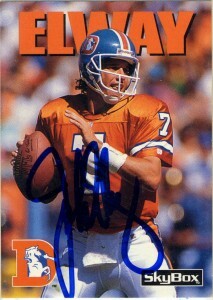 He’d be named NFL Offensive MVP and lead the Broncos to Superbowl XXIII. This would begin a series of heartbreaks for John, who despite his record 47 comebacks, – was labeled a choker in the big game after losing 3 Superbowls. By the early 1990s John’s feud with head coach Dan Reeves had come to a boil, and at one point during 1991 the Broncos discussed trading him to the Redskins. Reeves would be terminated after the 1992 season, an 8-8 record, and when Elway intimated it would be him or Reeves that had to go. With the hiring of Mike Shannahan, the team would quickly reload and march back to the playoffs by 1996. In 1997, Elway would get another shot at the SuperBowl, this time winning the big game at last against the Green Bay Packers. Owner Pat Bowlen after the game proclaimed, “This one is for John” and Elway beamed. He’d repeat again in 1998 in movie-like fashion, this time taking on the Atlanta Falcons and his ex head coach Dan Reeves. The Broncos would triumph and Elway would be named MVP. Soon there after Elway would announce his retirement due to age, lingering injuries, a desire to spend more time with his family and a feeling that he had no more to accomplish. He was inducted into the Pro Football HoF in 2004 as the first Denver Bronco with 9 Pro Bowl nominations under his belt and two SuperBowl victories. 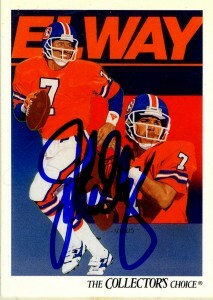 Elway since football has participated in a variety of sports ventures. He was the owner of the Colorado Crush of the failed AFL, and owns a few car dealerships and steak restaurants. He also hosts his own golf classic and is an open Republican. In early 2011 John Elway was named Vice President of Football Operations where he is expected to have a large amount of influence in the organization.